As I was saying, that last one wasn't actually K. Babuji's best effort. This one, recorded a year earlier (although the film appears to have been released later) is a fantastic record, and I love it to bits. Why? The super infectious funk-pop of 'Pyar Ka Tum Badla', the freaked-out sexiness of 'Aankh Ladti Hai', the beautiful trippiness of "Toob Sab Ki Mata", the oddball country-soul of 'Surangani', the harmonica driven spaghetti western vibe of 'Title Music', to name a handful, is why. Really though, every track here is good. 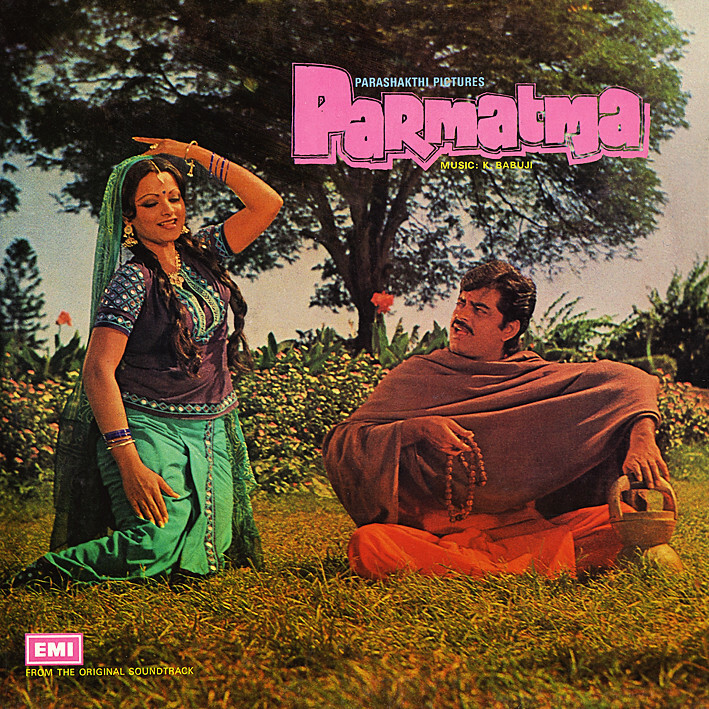 Fellow blogger Mr. Naidu once suggested that 'Parmatma' may be the best RD Burmanesque soundtrack written by someone else, and he has a point. You can hear the likeness, but you'll also find similarities to Kalyanji Anandji so maybe it's as much the era as any one influence. I'm sticking my neck out to claim this is among the best Bollywood soundtracks written by anybody. It is a pretty much flawless, absolutely killer score. Get it! High praise indeed from you! I will have to see if I can find the movie too! :) Thank you. Such an unassuming (dull, to be honest) cover too; I'd easily have passed on this one if Mr. Naidu hadn't posted clips from it a while back. Wonderful album this. Thank you very much. Thanks for seeking out the vinyl for this rare gem. Great write-up. And glad you liked as much as I do :) Unfortunately, K Babuji's career as producer and musical director was cut short due to his lack of box office success. I would have liked to have heard a lot more from him, but at least we now have a very nice vinyl rip of his best soundtrack. Thanks again, PC.